In 1946 Roy Milton started his own record label, Miltone, initially as a vehicle to promote his own recordings but soon it featured other musicians as well. 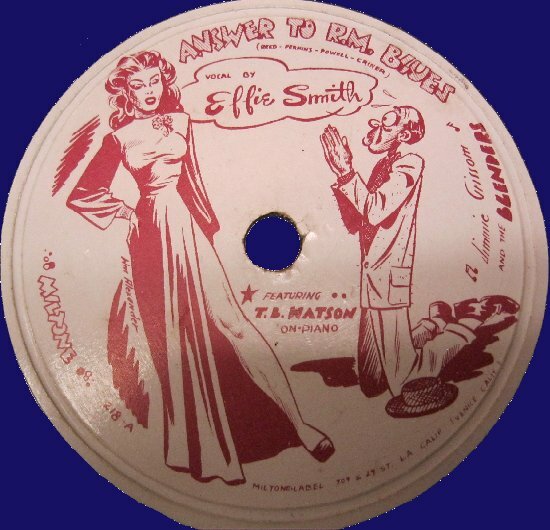 Among record collectors the 78s of this label are very much wanted for the cool cartoons of William 'Alex' Alexander that featured the labels of the records. I promised to put on a link to the web site that shows all of these labels, so here it goes, and another page (pdf) with more information and more label scans. Within a year, Milton and his business partner had gotten into legal fights with each other and the record company continued without Milton's involvement until that former business partner took off for Manila on the Philippines and the activities had come to an end. Despite the fights - and the chaotic catalog numbering system - Miltone put some wonderful Rhythm & Blues in the grooves and that music is being spotlighted in today's show.